The first Arlandria Code Compliance Walk of the year took place from 9 to 11 AM on Thursday, April 23. There was great city staff turnout to the walk, representing a solid show of support for the community improvement itch. CPT Eddie Reyes organized and led the walk, and we had representation from Planning and Zoning, the Sheriff's office, Alexandria Police, and the Alexandria Fire Department, to name a few. City Councilman Rob Krupicka showed up for the event kickoff. He offered supportive words that spoke to the progress that has been made in the area as well as the hope that continued improvements and redevelopment would lift up Arlandria residents to a better quality of life. The walk itself turned up many actions to resolve on both public and private property. It turned into more than a Code Compliance walk, as the city piled up a hefty list of things they themselves need to fix. Some recurring themes were cracked curbs, displaced pavers, weeds and unkempt shrubs, and illegal postings on utility poles and vacant storefronts. City staff was very receptive and promised that action items would receive follow-through in the near-term. All in all, staff documented 36 action items on the official list, with members of different departments noting other small items that fall into their purview. I'll post that when I get my hands on it. We'll be sure to keep them on task and check back on progress in coming weeks and months. CPT Reyes also mentioned he wants to lead additional Code Compliance walks in the coming months to cover the rest of Arlandria and its many neighborhoods. The next one will likely take place in about a month and will focus on points east of Mt. Vernon Ave (Hume Springs, E. Reed Avenue, and hopefully Lynhaven). CPT Reyes said he'll try and figure out a way to host some walks on weekends, though that would likely decrease city staff attendance, somewhat. 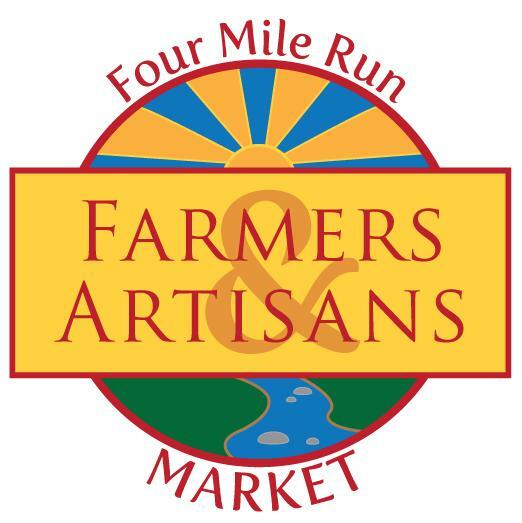 On a related note, Open Space coordinator Laura Durham suggested residents volunteer under the Adopt-A-Garden program to create and maintain temporary gardens in front of the four purchased lots that will eventually be part of the Four Mile Run Park expansion (planning for which will be kicked off in the next month). Stay tuned for more on that topic. 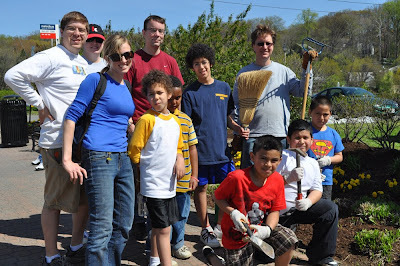 On Saturday, 20 people of all ages and from all around the city came out to clean up Arlandria along Mt. 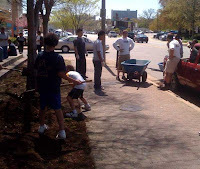 Vernon Ave. We mulched at least a couple thousand square feet of ground, installed two gardens where only weeds once grew, added plantings and mulch to 3 gardens, cleaned up litter, weeded, and generally worked our collective butts off to make the Arlandria section of Mt. Vernon Ave a little bit of a better place. The weather was great and everyone seemed to have fun, despite being very tired by the end of it all. Cutting Edge Lawn and Landscaping, who hauled the mulch and flowers, lent tools for the day, and helped haul of trash and debris. David Escobar, owner of My Bakery and Cafe, who provided lunch for all volunteers at the restaurant (very tasty! 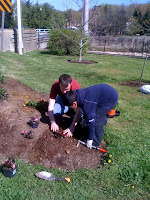 ), volunteered himself, and brought some employees with him to ensure even more got done. The Lowe's at 6750 Richmond Hwy, who provided a discount on flowers. All the volunteers that dedicated this beautiful spring day to improving the community! Check back for additional projects we'll be working on in the near future. We got a lot done, but there is and will be a lot more to do! For now, take a look at some of the projects we got done. I don't have any before pictures shown, but this was a heck of an improvement. 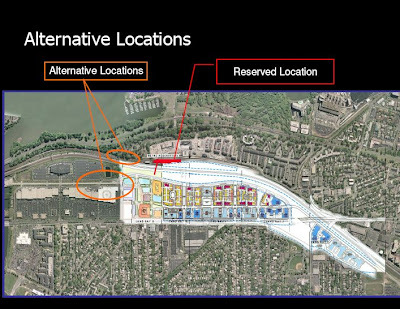 Earlier this week, Alexandria's Potomac Yard Metro Station Feasibility Work Group was presented with an analysis of various options for the location of a potential future Metro station. 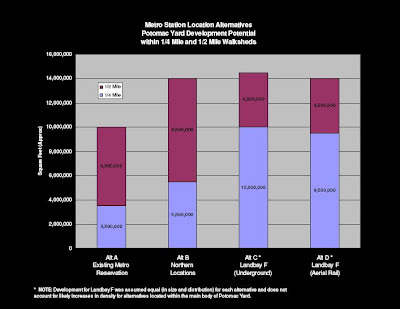 As we discussed here and here, the site of the area currently reserved for Metro is at odds with the ideal proximity of any new station to existing or future development. 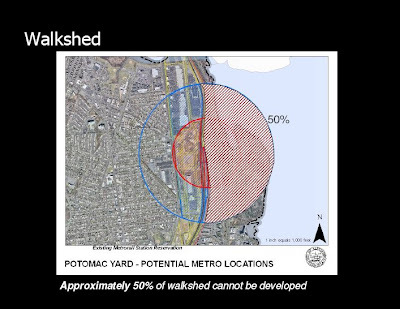 Moving the rail lines closer to Route 1 would incur a higher cost, but would also have to deal with the impacts to the wetlands areas along the Potomac River as well as FAA height limitations required for nearby National Airport. Some of the alternatives envisioned are already deemed totally unfeasible because of existing development that has come online in the last few years. And the costs differences between the others are fairly substantial. The presentation lays out the alternatives fairly nicely. It's clear that there are trade-offs to be considered and costs to be borne. But it still remains to be seen whether any of the levels of development will be deemed acceptable by the community in order to provide the developer subsidies necessary to build any of it. "High quality public spaces bring people out. Safety increases; people enjoy their city and acquire a sense of belonging. More than sidewalks or bicycle paths, we built symbols of equality and respect for human dignity." New trail construction is about to be completed in Arlandria that will serve to link the South Glebe / West Glebe intersection to Shirlington Road....and thereby connect the Four Mile Run Trail to the WO&D trail. It may not be quite as far reaching as in Bogota, but it's an important & necessary linkage that significantly moves such a network forward. The Four Mile Run Plan envisions many more small, but crucial improvements over the next few decades. This modest extension is very much the first of these. What's glaringly missing from these pictures is the human activity that the trail is meant for. While this is a start, it's clear there's much more to be done and the Four Mile Run plan is the road map to get us there. Penalosa's vision is not just platitudes. When Bogota invested in some simple human-scaled infrastructure, the results were extraordinarily successful. It can happen here too. Take a look at this brief film and imagine the possibilities. Here's a great opportunity for anyone that is looking to voice their concerns for the relative lack of maintenance and interest in the neighborhood to someone that has to listen. Is there a spot that sorely needs a trashcan? A sidewalk that is a trip hazard, or perhaps a building that you just know is not compliant with some code or another? 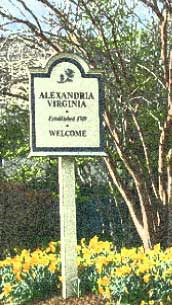 Come on out and walk the neighborhood with Alexandria officials and voice your concerns! WHEN: Thursday, April 23, 2009 / 9:00 A.M. to 11:00 A.M.
WHERE: Tenants and Workers United – 3801 Mt. Vernon Ave. The purpose of this event is to walk the area of Mount Vernon Ave. from the 3800 block to the 4100 block and identify any quality of life issues and/or code compliance matters. "Larry Ponzi’s Café Pizzaiolo opened in 2007, and it’s been an antidote to the Crystal City mall across the street. The cafe’s bustle, chalkboards, and children’s games give it the feel of a neighborhood coffeehouse—there’s free wi-fi—crossed with a family room and a no-frills Italian restaurant. The pizzas, like the casual vibe, are easy to like: Crafted with the care devoted to boutique pies, these have approachable toppings, a generous swipe of sweet sauce, and crisp crusts. In November, Ponzi brought his pizzas and the rest of the menu—a roster of Italian favorites such as chicken Parmesan and spaghetti with meatballs—to Alexandria’s Del Ray neighborhood." The new, local Pizzaiolo location is part of the retail strip at the Calvert (seen above) and not in the Mt Vernon Avenue Business District as normally defined. Whether the Calvert is in Del Ray, Arlandria, North Del Ray or, a some have dubbed it, "Delandria", it doesn't change the fact that its local and the pizza is good. After I requested that GWSlepthere.com add our blog to their "In Blogs We Trust" list, they asked us a few questions about what we're trying to do and gave us a nice little write-up. Go check it out here. They focus on Alexandria from a real estate slant, though they also discuss general neighborhood goings-on around Alexandria. We've added them to our blog roll on the right.